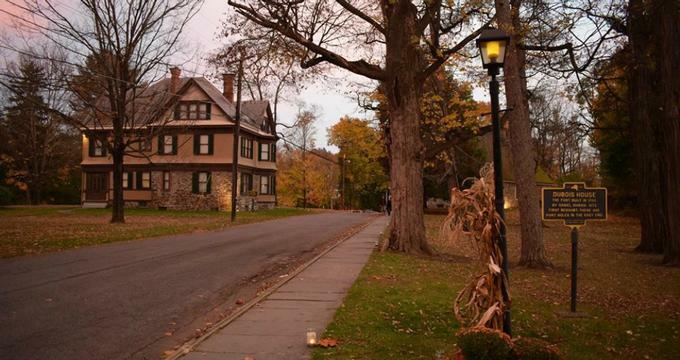 The Historic Huguenot Street District is a 10-acre National Historic Landmark District in New Paltz, NY that echoes life as it was in 1678 when several Huguenot families settled in the area. 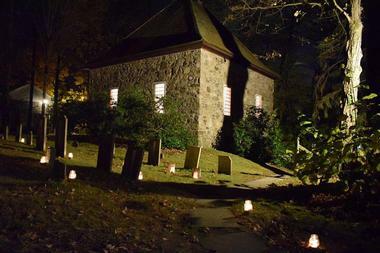 The famous district features seven early 18th century historic stone houses and several accompanying structures, a reconstructed 1717 Huguenot church, numerous archaeological sites and a burial ground dating back to the first settlers, and a modern visitor center with additional exhibit and program spaces. Huguenot Street is also home to an extensive archive and research library that preserves early family papers and local history collections. The Historic Huguenot Street District is one of the oldest inhabited settlements in the United States. A group of Huguenot families settled in the Hudson Valley of New York in 1678 and grew into an established community over the following decades. With a view to maintaining their rich culture and heritage, as well as the beautiful buildings they built and various objects and stories collected over the years, in 1894 descendants of the settlers formed what is now the Historic Huguenot Street District. Today, this historic area can be explored on a variety of guided tours from architectural to culinary, and a diverse range of special programs that highlight the fascinating history of the district. An array of cultures and nations called Huguenot Street from African, English, and Dutch to French and Indian, all of whom played a role in the multicultural diversity of the district and helping them obtain a new identity as Americans. 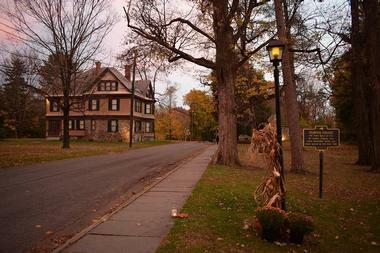 Today, the 10-acre National Historic Landmark District offers an in-depth look at life during the late 19th century with many beautifully preserved buildings and historic stone houses, a 1717 Huguenot church that has been reconstructed to its former glory, various archaeological sites and a cemetery and burial ground dating back to the early settlers. There is also a new Visitor Center and several exhibition and program spaces, as well as an extensive archive and research library that preserves and presents early historical documents, collections and family papers. The District is home to seven notable old stone houses that were built by the early settlers and have been beautifully preserved to present outstanding examples of the early architectural vernacular during this time. These houses include the Bevier-Elting House (1894), the Abraham (Daniel) Hasbrouck House (1720), the Jean Hasbrouck House (1721), the Louis DuBois House aka the Dubois Fort (1705), the Freer House, and the Deyo House (circa 1720). Other notable buildings and structures include the Crispell Memorial French Church (1717), the LeFevre House (1799), Deyo Hall, and the Roosa House Library and Archives. Owned and operated by Historic Huguenot Street (HHS), which was founded in 1894, the Historic Huguenot Street District began to offer educational, and community-based programs and projects I the 1980s and continue to do to so today. The site offers an array of public programming year-round for all ages, including exhibitions, interpretations, demonstrations and more. Camp Huguenot offers children of all ages the opportunity to discover, explore, and experience Historic Huguenot Street and its rich history and heritage. Campers will also have a chance to learn more about archaeology as they work alongside real archaeologists on a live dig searching for artifacts left behind by the original Huguenot settlers and the Native Americans who lived in the area before them. Campers will learn the basic principles and practices of archaeology by excavating, cleaning, cataloging their finds, and figuring out their significance and relation to the understanding of past cultures. Their finds are then exhibited at the end of the week where family members can admire their work. Other activities on the week-long camp include traditional arts and crafts, local field trips, indoor and outdoor games, and tours of the historic site. The Historic Huguenot Street District is in New Paltz in New York and can be explored on free walking tours or private guided tours. 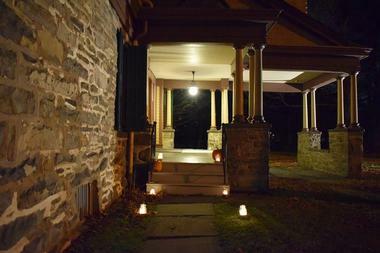 A free walking tour of the National Historic Landmark District can be downloaded and features all the best attractions, the 300-year old histories of the famous stone houses on the street with background information, as well as photos of the interiors and the pieces of the collection inside. For a more in-depth discovery of the District, private docent-led guided tours can be booked and feature an exploration of the houses by appointment. School tours can also be arranged. The District has a new Visitor Center which provides guests with an array of information on the area the houses, buildings, and structures within it and the rich history and heritage of the District. The Museum Shop at the Visitor Center sells a variety of Historic Huguenot Street District-related items, objects, books, and gifts and there is a peaceful shaded picnic area on the grounds of the Center where visitors can enjoy lunch. For those who prefer a sit-down meal, there are several local eateries within a short walk from Huguenot Street.